Put your career ambitions to the test with with The Sims TM 3 Deluxe. 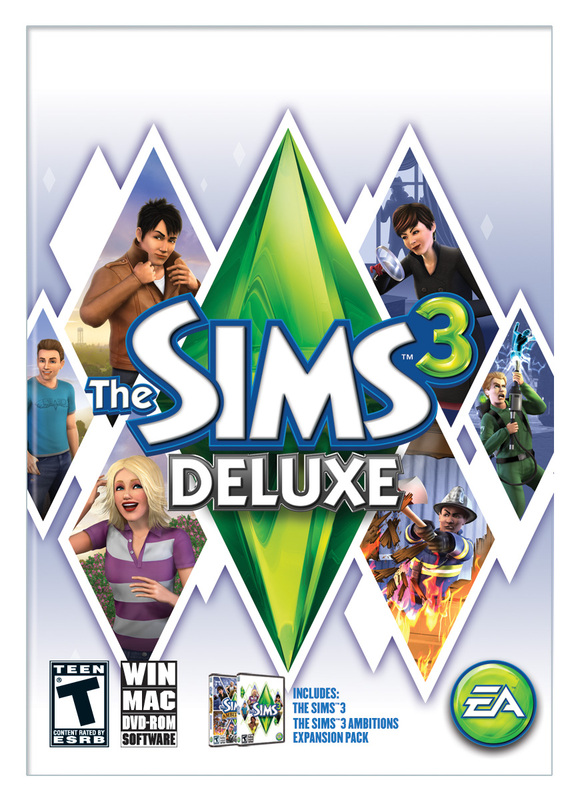 Now available in retail stores across North America, The Sims 3 Deluxe for PC/MAC includes The Sims 3, the best-selling PC game of 2009* and The Sims 3 Ambitions, a robust expansion pack that allows you to pursue a variety of exciting careers in your Sims’ lives. Climb the ladder of success as a Firefighter, Private Investigator, Architecture Designer, Doctor, Ghost Hunter or Stylist. Your choices can affect your town. Will you be good, or will you be mischievous. You decide. Create any Sims you can imagine! Design your ultimate Sim by choosing up to five traits and numerous body characteristics in the Create-a-Sim feature. Customize your Sims body type, facial features, hair styles, and more. Create an evil, handsome, ripped kleptomaniac that wreaks havoc on those around. Customize everything! You are the designer! From clothing to houses, customize patterns, colors, or create any house you can imagine. Customize any aspect of your Sims’ style…even down to the style and color of their shoes! Be the Director of your Sims’ movies! Never before have you been able to make your own movie with a cast, a set, soundtrack, a story and editing without leaving the game. Make a movie with the Create-a-Movie tool and share it with the world! Connect, Share and Shop! Register with The Sims 3 online community and receive a second town, as well as 1,000 SimPoints to be used at The Sims 3 Store. Show off your creations from Sims to houses. Download exclusive content and hear the latest news of The Sims 3 world first. IMPACT: Your Sims’ on-the-job choices now change their town and affect other Sims. Modify the town’s structure as an architecture designer or set neighborhood fashions as a stylist. As a perfect gift for back-to-school or for anyone in the family, The Sims 3 Deluxe is now available on store shelves across North America. For more information about The Sims 3 Deluxe or any of The Sims titles, please visit www.TheSims3.com. Developed by The Sims Studio, The Sims 3 Deluxe is rated T for Teen by the ESRB.